Amazing mixed swirls of pink, peach and cream. Mid season flowering, 40cm tall. Pack of 5. Amazing mixed swirls of pink, peach and cream. Early-mid season flowering, 40cm tall. 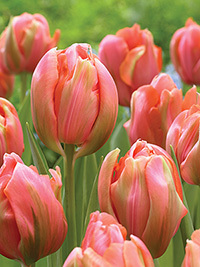 Peony tulips are double flowered like a peony rose, they are very attractive and have a bold colour range.